Remember a couple weeks ago when the Columbus Dispatch and Columbus Business First, on the same day, gave above-the-fold news coverage to suburbs and on the same topic? The odds of either publication running any suburban story above the fold on any day are pretty slim (just being honest) much less the same day and with the same story line. Clearly, you can't get such an incredible coincidence to happen by mere coincidence. When you factor in that the stories had the same story line but different sources and quotes tells one, with very little critical thinking at work here, that this was no coincidence. Only tactical planning can pull that off. Some lobbying groups out there are working to fight for cities' piece of the pie at expense of suburbs. It's a win-lose fight for a piece of a shrinking pie mentality instead of a grow the pie so everyone gets a bigger piece mentality that would be a win-win for all. Joel Kotkin's NewGeography.com has given the counter answer just in the nick of time. The concerted attempt to portray suburbs as facing poverty issues on par with big cities is not only a tactic in some groups' strategy, but it's also lacking facts. 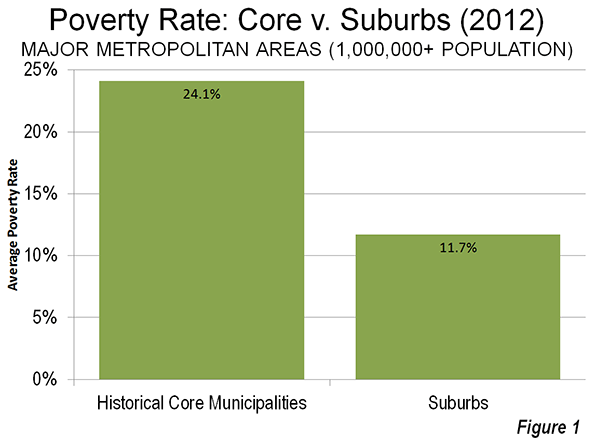 See Wendell Cox's one chart above or see the whole article titled "Suburban & Urban Core 2012: Special Report." Incidentally, the Columbus MSA suburbs were, on average, at 9.9% poverty rates. Those rates are below the suburban poverty rate nationally and on par or below some comparable cities like those of Austin, Charlotte, and Raleigh. What's the point? It's not about boasting a lower poverty rate at all. Any poverty rate is too high. Instead, it's about ferreting out the fact that a concerted effort is underway to boost policies for cities at the expense of suburbs. Critical thinking needs honed in the suburbs. It's just few of us involved in economic development in the suburbs even realize there is a battle in the first place.